George was driver in the 2nd Mechanical Transport Company like M. Harry HARTLEY but he was enrolled in the 3rd auxiliary mechanical transport company. M. George EDWARDS married at Amiens cathedral with Miss Sueur native to Doullens town, managed a hotel known in the past under the name Hotel LAMARTINE nearest the Alexandre Fatton street. 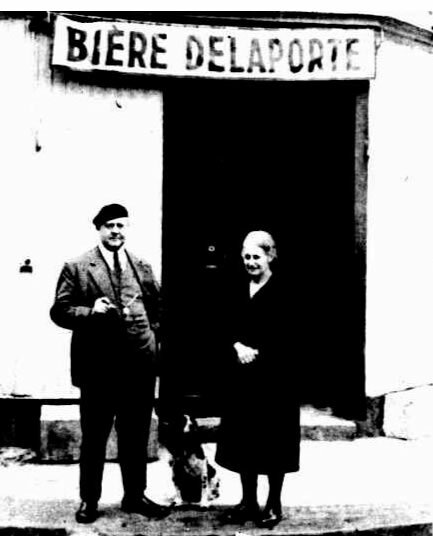 He worked with Delaporte beer, manufactured at Amiens also. This research was initiate by Mrs Louise DESSAIVRE from Amiens Cathedral friends, in order to find more information about the wedding in the Cathedral and family. My friend Helen CASTLE helped us to find the portrait of M. EDWARDS and M. Mickael FIECHTNER provided us, by an happy coincidence the graffiti photo of the underground caves of Naours done by George. Roland was enlisted the 22 September 1914 in the Depot Unit of Supply 2. He embarked the 22 December 1914, on board HMAT A35 Berrima. He survived the landing of Gallipoli and he had been wounded during the first war at Villers-Bretonneux. For the 2nd world war, he served as liaison officer with the British army. Roland Goddard led several businesses in Amiens region. 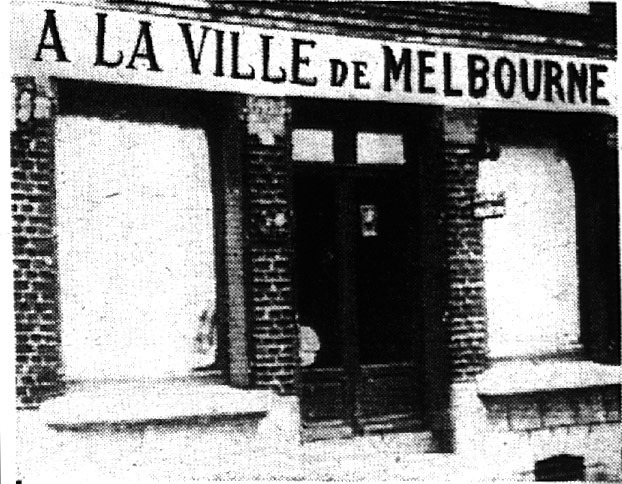 He managed a shop at Villers-Bretonneux called "To the city of Melbourne", it was a clothing shop. He runned later a trade in the Amiens market for children’s clothing. The shop was called: "To the Temptation of the Mothers". When the Germans were invading France, he had leave everything he owned. 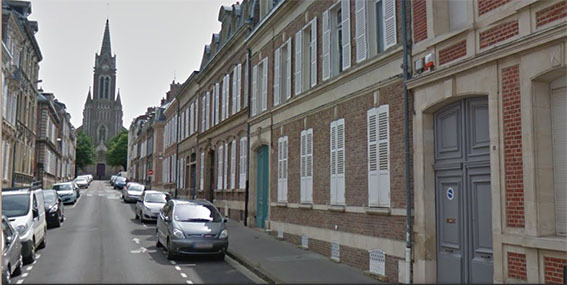 Later, he opened the Anzac Hotel based at Amiens near the station after the second world war. The hotel, street Debray was a pleasant hotel and his wife Isobel cooked delicious dishes there. The reconstruction of this story has been possible after a few exchanges with the family. Thank you Jeff for this sharing. Clothing shop at Villers-Bretonneux. "To the city of Melbourne !" Roland and his wife. 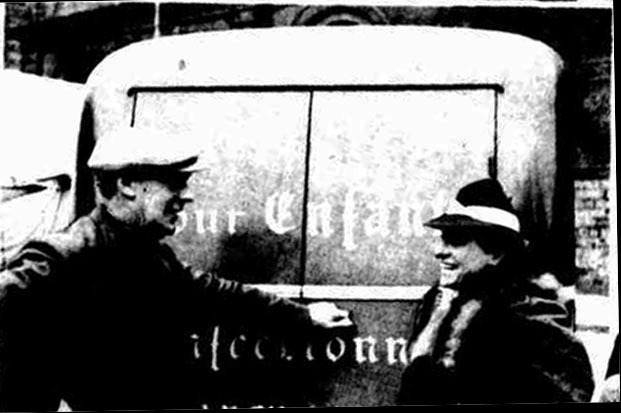 You can read on the truck: "Pour Enfant" : for children and below "confectionnés": handcrafted.. The shop was located in the market place of Amiens. In my humble opinion near the belfry, place long been known for be the market center, even it was rebuilt further after the war. The grey door was the entrance hotel.